For the first time Porsche is showing images of the centrepiece of its Le Mans winning 919 Hybrid. Back in 2014, the company entered the FIA WEC with the most innovative drive concept on the entire grid. A turbo charged four-cylinder combustion engine to drive the rear axle, an exhaust energy recovery system, the latest lithium-ion battery technology for energy storage to serve the e-machine on the front axle, complex hybrid management – Porsche had set new standards in this technically most demanding world championship. 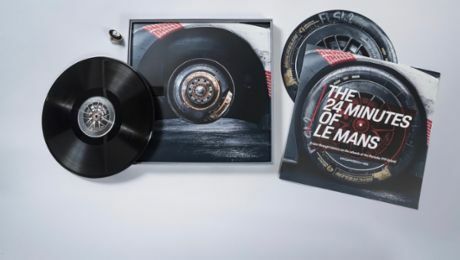 In 2015, which was only the second year of competing, the team was rewarded with successes: A one-two result at the Le Mans 24-Hours and the manufacturers’ and drivers’ World Championship titles. The Porsche 919 Hybrid’s engine will be on display at race events, exhibitions and, of course, in the Porsche Museum at Stuttgart-Zuffenhausen. As with every Porsche, the 919 Hybrid is being developed in Weissach at Porsche’s Research and Development centre. Especially when it comes to the powertrain, Hitzinger’s crew works very closely with the engineers from production cars. “They support us significantly in the areas of combustion development and fuel-mixture generation,” said Hitzinger. Despite all its affinities, the 919’s four-cylinder isn’t a flat engine like the new turbo generation for the 718 Boxster, as instead it has a 90 degree V angle. The small powerhouse, with which Porsche took its 17th overall win at the Le Mans 24-Hours last year, had over 500 hp back then. However, for 2016 the regulations require a lower amount of energy from the fuel used per lap and have reduced the fuel flow for all the prototypes. For the Porsche race engine this results in a loss of eight per cent of fuel and, therefore, output which now translates into a figure of less than 500 hp. Together with the electrical energy from the two recovery systems (brake energy from the front axle and exhaust energy), which serve the e-machine on the front axle, the Porsche 919 Hybrid’s overall power system is now circa 900 hp. The regulations for the top segment of the WEC (class 1 Le Mans prototypes, LMP1) require manufacturers to use hybrid drive systems. They also establish a direct link between the sporty performance of the prototypes and their energy efficiency. Put simply, this means that a large amount of energy from recovery systems may be used. However, this entails a proportional reduction in the permitted amount of fuel per lap. The WEC gives engineers a great degree of freedom in terms of the hybrid drive concepts that may be employed. The teams can choose between diesel and petrol engines, naturally aspirated or turbocharged engines, various displacements, and one or two energy recovery systems.This set-up puts the focus on innovations that will have a huge impact on future production sports cars – and this was actually the main reason why Porsche decided to return to the world of top level motor racing. The 2016 FIA World Endurance Championship (WEC) kicks off with the traditional Prologue in Paul Ricard, Southern France. For the season’s highlight in Le Mans a field which is stronger by two cars has been announced, which means 60 race cars will now compete on the famous 13.629 kilometre long circuit. Expansion has also happened to the race calendar: In 2016 the WEC will will run for the first time on the new Mexico City Formula One circuit. This increases the calendar to nine races in nine countries. With the exception of Le Mans, the races are always six hours long and the field will be 32 cars divided into four classes. A closer look at the four-cylinder flat engine and its history.